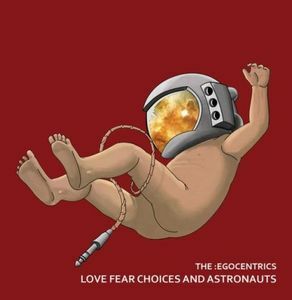 The Egocentrics - "Love Fear Choices and Astronauts"
This Romanian band has arrived with their debut record out on Nasoni Records. I reviewed their very Colour Haze inspired demo CD last year and one of those tracks is also on this vinyl record but they had been re-recorded. The band is a three piece instrumental act and they play psychedelic rock and are very inspired by Colour Haze. On the demo I would say they sound a bit too close but here they have altered the sound production to sound less like Colour Haze. Spacewulf starts things off and is a nice building track with both slow and faster parts, melodic spacey guitars and also very Stefan Koglek like guitar playing as well. 2012 is next and starts with some interesting riffing and interaction between the musicians before they decide on a path and the wah pedal kicks in and the riffing becomes more intense. The spacey guitar part at the end is really cool and they throw in some spoken word samples as well. Side 2 starts with the song Bright Dawn of the Soul. This is a more relaxed track with not as many directions and ideas as the last. Like all the tracks, it is based on some very nice guitar playing. The LP ends with Mystic Initiation, which was on the demo CD from 2008. It is a more uptempo piece that starts with some cool wah guitar and then into a very Colour Haze like piece. A pretty cool record.